I’ve spent most of my time in Mozambique exploring Maputo, a busy, interesting African city. After touring isolated Seychelles, Durban, and South Africa’s KwaZulu-Natal beaches, it was fun to be in a vibrant city again. There’s lots of history and culture in Maputo, and the diverse population is fascinating. I’ve enjoyed my time here, and after a month gained an understanding of Mozambique’s history, culture, and people. 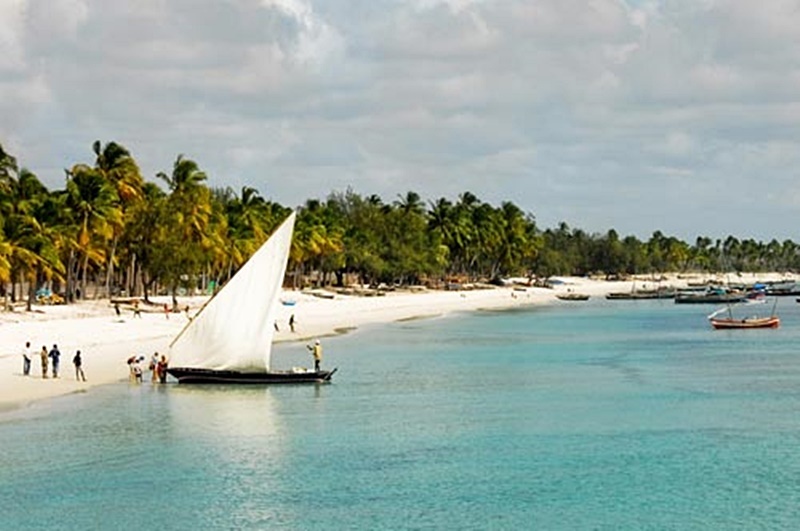 People come to Mozambique to visit its islands and archipelagos – Bazaruto and Quirimbas – known for their coral reefs and marine life. Since I’m leaving Mozambique this week, I decided to take a day tour of Inhaca Island, about 20 miles from Maputo. 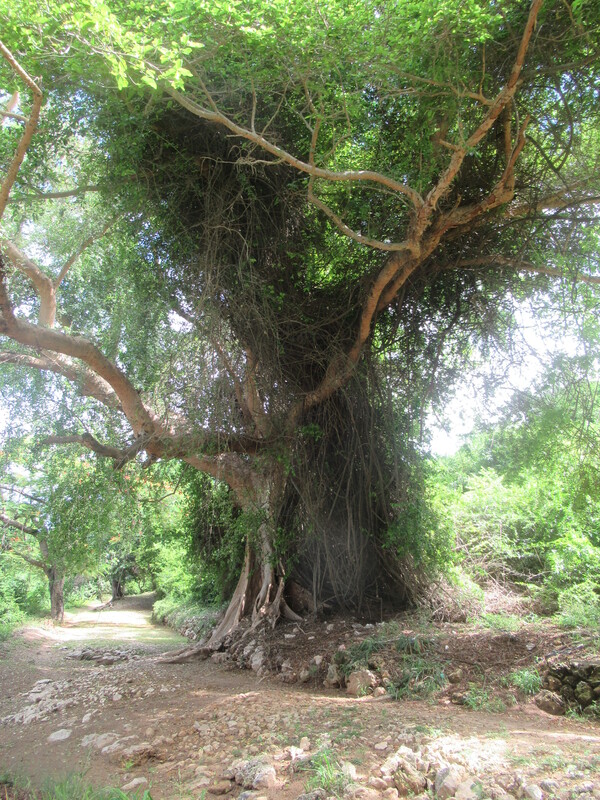 Getting to Inhaca can be complicated. There are three ways to do it – ferry, plane, or boat, and all three are subject to cancellation, depending on the weather. The flight takes 15 minutes, the ferry (if it’s running that day) takes several hours. 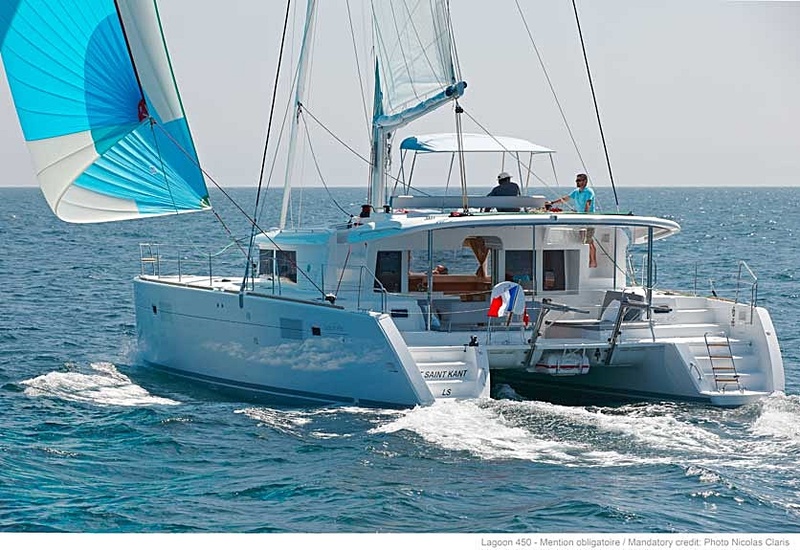 Boat options range from small crowded refugee-like vessels to wooden dhows and luxury yachts. I decided to go with Maputo Yachting’s comfortable catamaran Umoja. The day trip was reasonably priced, and I only had to get to Porto de Pesca with a swim suit, hat, and sunscreen – no connections, transfers, or other complications. The day didn’t disappoint! Catamaran Umoja (meaning unity in Swahili) was fantastic, and the interesting people onboard were easy to talk with and fun. Although slightly overcast, the day was pleasant. A day of full-on sun would have been uncomfortable. Our European Captain – Wilhelm – was from Norway. Two of his friends – Norwegian and Dutch – joined the outing and helped with various tasks. In addition to the captain and his friends, there were two other crew members. It was a fast-moving day. Passengers included three young Mozambican women – twin sisters with a friend, German, Portuguese, and Belgian couples, and me. Except for the Germans, everyone was living in Maputo. The diverse group was great company. If I weren’t leaving Maputo in a few days, I would enjoy spending more time with them. One woman was an artist collaborating with local Mozambicans to create a relief-like mural. 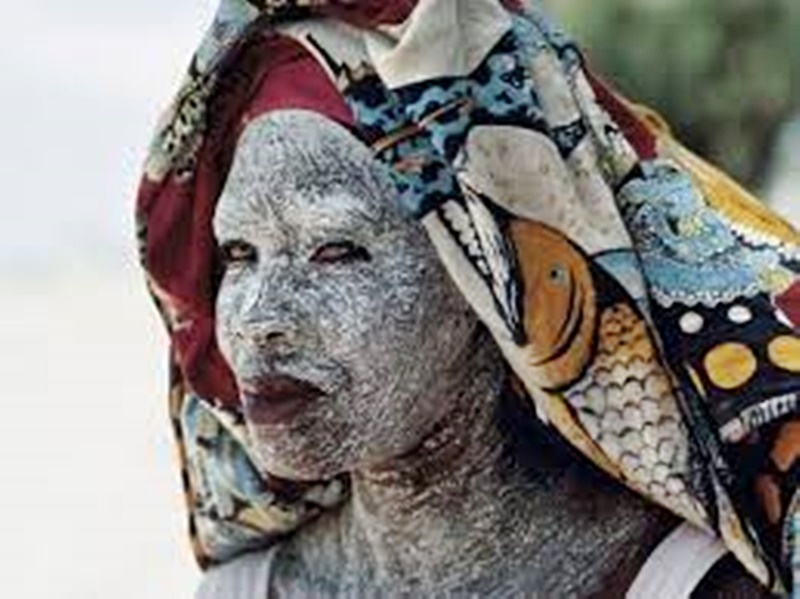 Her husband works with African non-governmental organizations (NGOs) and had been on a project in Ethiopia, where they lived for several years. They talked of Ethiopian life and politics. Ethiopia is in messy political turmoil. The government imposed a six-month “state of emergency” after prolonged anti-government protests and the resignation of the Prime Minister. Protests prompted the release of political prisoners but ongoing demonstrations raise serious concerns about Ethiopia’s stability. After listening to Europeans living in Maputo, I’ve learned that many have traveled extensively throughout Africa and accept the continent’s abundant difficulties and unfortunate inequities. Despite many often-disturbing realities, they do what they can to make a positive difference and enjoy the excitement and unknowns that come with living in Africa. It surprised me to hear Norwegians talk about the “boredom” of living in their country, rated as one of the most desirable places in the world. A Dutch member of the group was married to a lovely African woman. They have several children. A creative director, he told me of performances he’s directed. People I’ve met in Maputo were regular visitors to Mali. They’re sad the country is no longer safe for travelers. Al-Qaeda and armed Islamist groups have taken control of parts of the country “imposing Sharia (Islamic law) by threatening villagers, recruiting children, destroying schools, and beating those who engage in forbidden practices”. The conversations were interesting, and I was glad to meet other people who share my fascination with Africa – but I’m digressing, so back to the boat trip. As the wind picked up, we hoisted a sail and glided to our first stop, Portuguese Island (Inhaca). 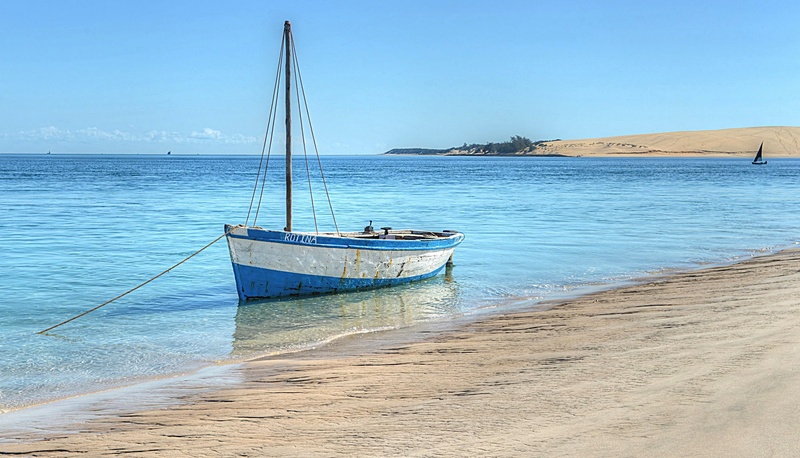 Uninhabited Portuguese Island is less than a 2-hour sail from Maputo at the end of Maputo Bay. At one time, the desert island was a leper colony. Now, it’s part of the Inhaca Marine Reserve. 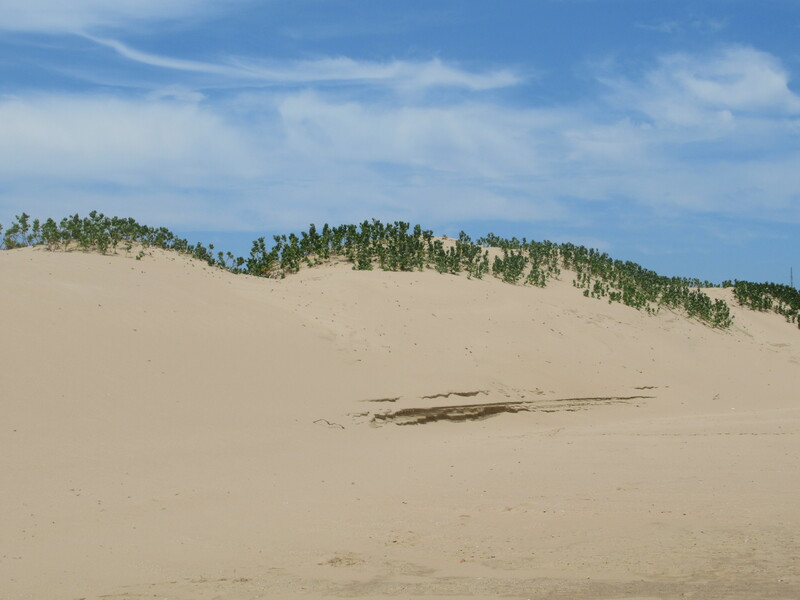 The narrow island is 4 miles long with low vegetation. My hat blew off on the boat and is now somewhere beneath the sea, so instead of hiking with little sun protection, I opted to swim. 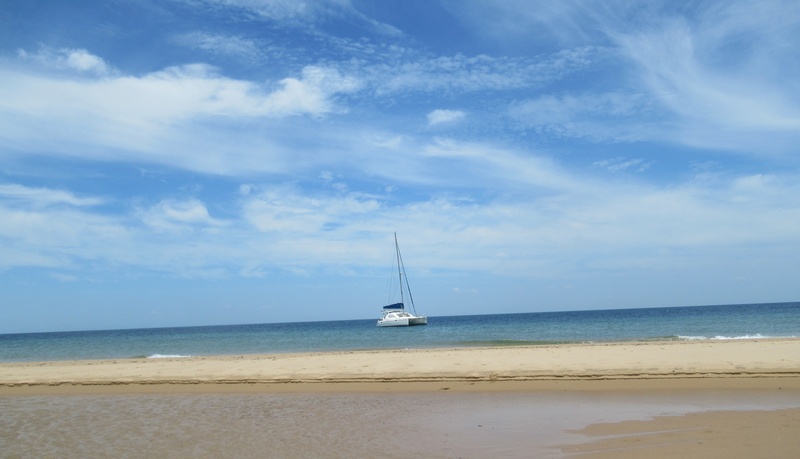 The boat didn’t have equipment, so there was no snorkeling – never forget to ask enough questions in Maputo! There’s a kiosk on the beach for cruise ship guests. Although a cruise ship anchored nearby, few people came ashore, and there were no beach umbrellas or chairs. I talked to local vendors and almost bought another capulana (sarong), but came to my senses after thinking about an already bulging suitcase. I bought the only hat available – a baseball cap locally made with colorful Mozambican fabric – not much sun protection, but a fabulous memento. Mozambique’s archipelagos are home to the only viable population of dugongs on Africa’s east coast. 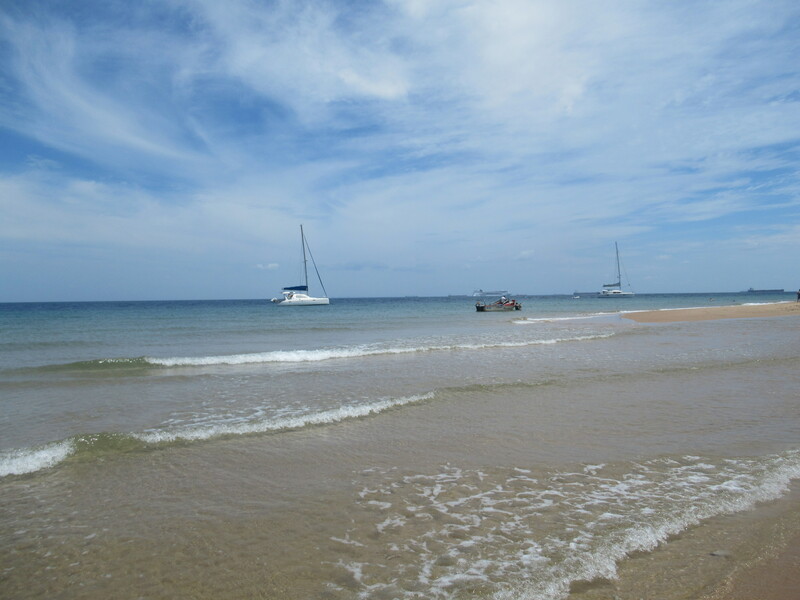 Swimming in the Indian Ocean is heaven, and we watched small pods of dolphins come near us playing close to shore. I swam back to the boat, while others took the dingy. We enjoyed lunch aboard Umoja, including the best bruschetta I’ve eaten prepared by Michael, a Dutch chef and friend of the captain. The meal was a delicious curry served with salad and rice. After lunch we continued to Inhaca – pronounced “In-ya-ca”. 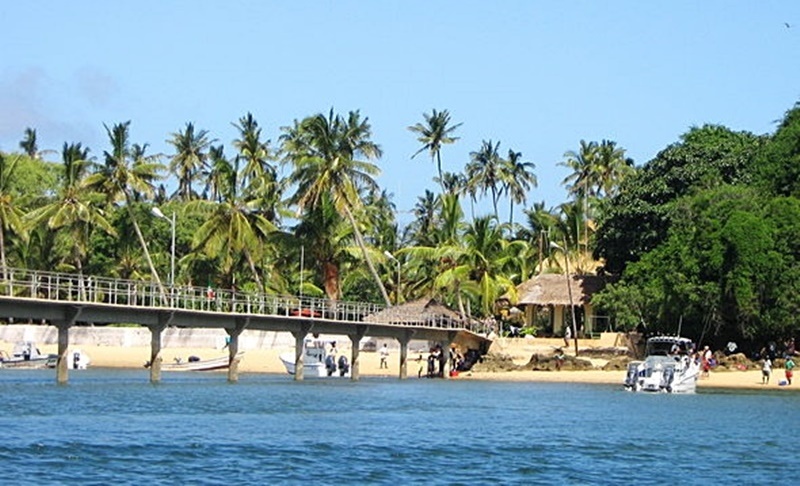 Populated by local Mozambicans, the island has a few rustic restaurants, wildlife, and pristine forests. I noticed several large, interesting birds but couldn’t get good photos. White herons with long gangling legs and necks were hanging all over the trees. After months of travel, I’m burnt out on photos and use some media shots in this post. Inhaca Island is understandably popular for water sports. Locals and tourists alike enjoy diving, swimming, snorkeling, kayaking, windsurfing, and fishing. If you don’t have your own equipment, it’s difficult finding rentals. 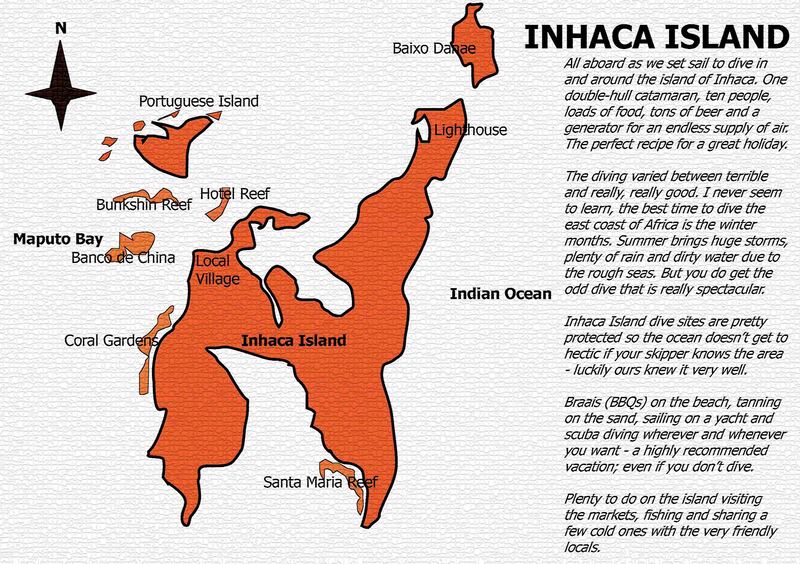 We didn’t explore the “wilder side“, of Inhaca – a dive site known for its coral reefs, crashing surf, and deep blue sea. 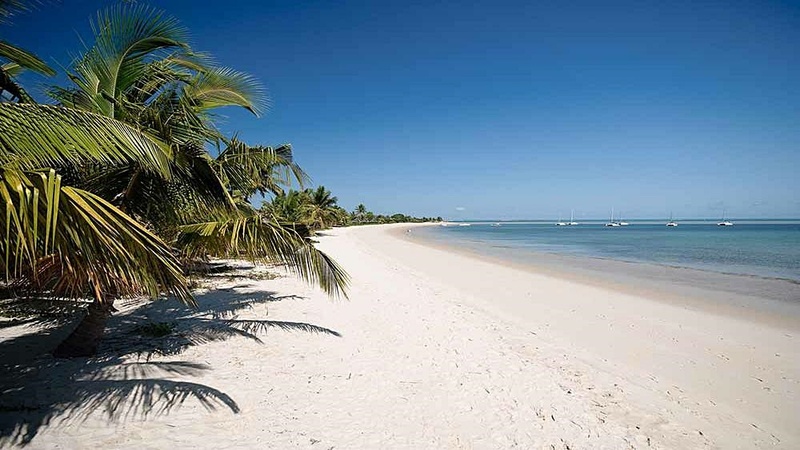 Bazaruto Archipelago National Park was established to protect habitats and marine fauna. Warm water currents in Mozambique Channel between Africa and Madagascar, encourage diverse marine life, including sea turtles, dolphins, endangered dugongs, manta rays, and whales. I’ve heard that dive sites on Santa Maria Reef include unforgettable, mesmerizing underwater caves and shipwrecks. Vilanculos District is the gateway to Bazaruto Archipelago – a chain of four islands, Bazaruto, Benguerra, Santa Isobel, and Santa Carolina. 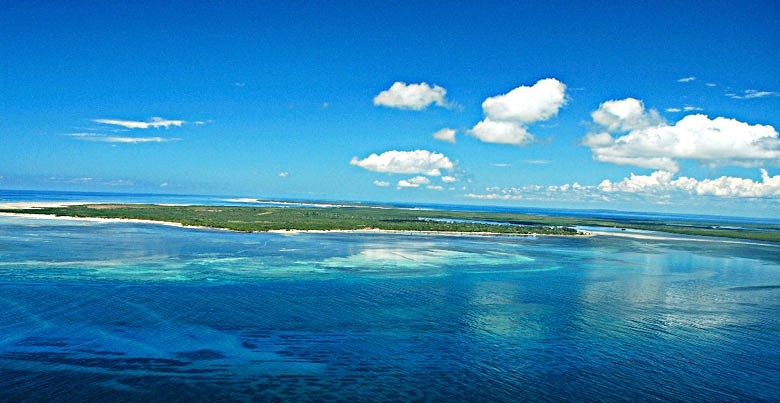 The area’s marine life is protected by Bazaruto Archipelago National Park (BANP). 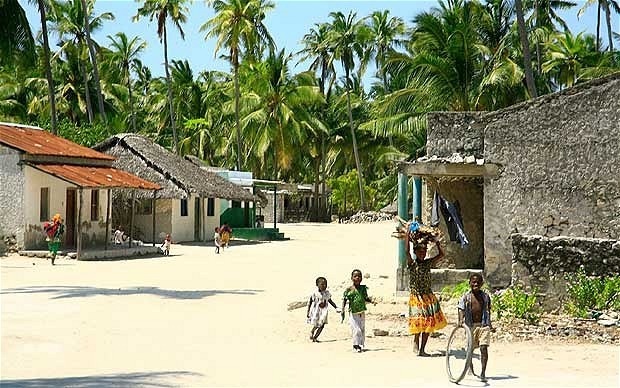 The Vahoka people occupy Bazaruto Archipelago’s islands. Vahoka speak their mother tongue, Chihoca, and live in seven villages throughout the islands. The Port of Pemba in northern Mozambique is the access point for Quirimbas Archipelago with 12 isolated islands and 20 coralline outcrops. 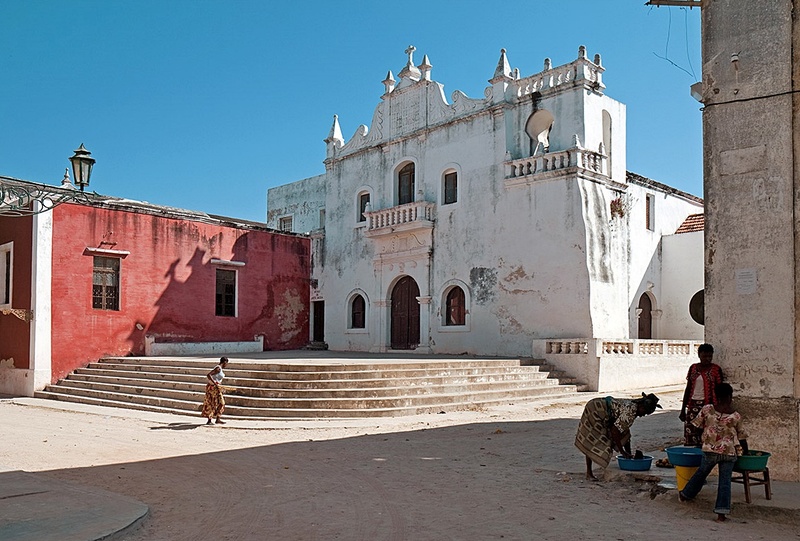 Pemba is the capital of Cabo Delgado Province. There are remote lodges on the archipelago, but getting to them is costly and difficult. Local tour operators are more than willing to handle the logistics and plan pricey all-inclusive luxury holidays. Pemba’s coral reefs are near the shore and “protrude into the Bay of Pemba.” It’s the starting point for Quirimbas National Park which is inhabited by endangered dolphins, whales, and dugongs. I would love to spend time exploring Quirimbas, but it’s beyond my budget as a solo traveler. I wanted to keep swimming, but the others thought we should go. We said goodbye to Inhaca and headed back to Maputo. Tropical storms develop quickly, and thunderstorms with lightning, wind, and heavy rain were on the way. As if our day hadn’t been indulgent enough, fresh pastries were waiting for us on the boat! Some in the group sang their humorous versions of African and German songs. The only one left unsung was Whiskey Leave Me Alone! 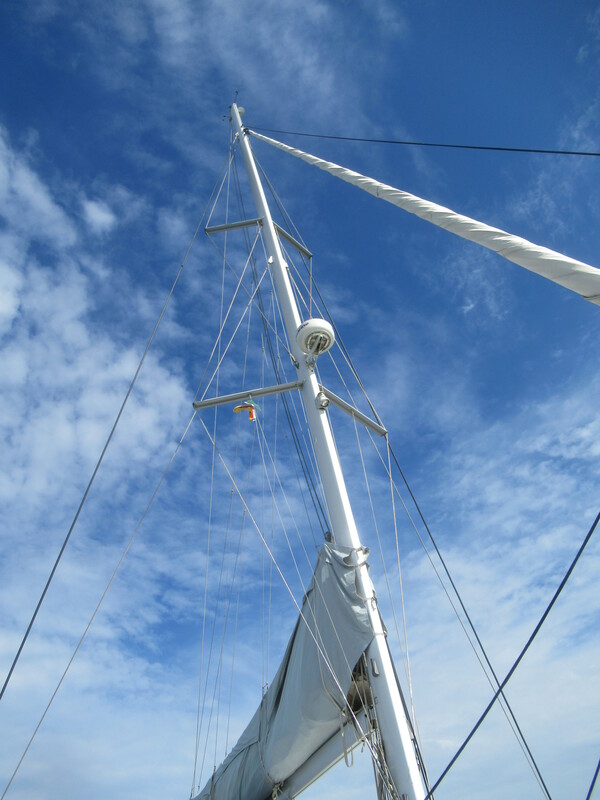 The warm sun and swaying catamaran made us feel sleepy, and several fell asleep on the deck. 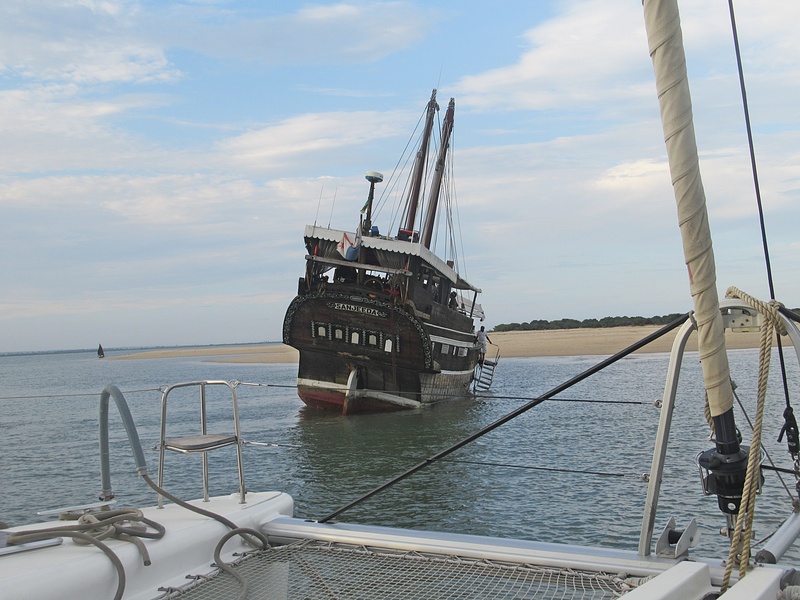 About an hour into the trip back, the captain received a distress call from a boat stuck in a sand bank closer to Maputo. 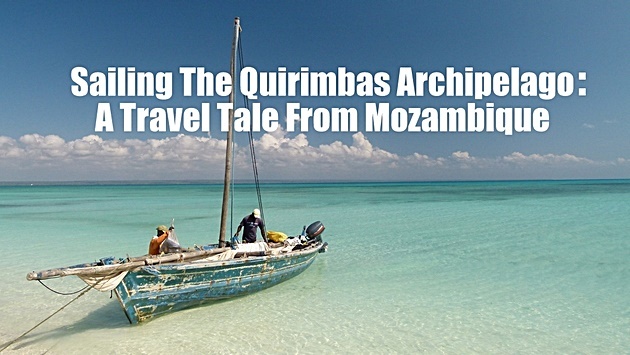 The passengers – 80 Mozambicans on a “drinks included” trip – were celebrating a birthday and partying all day. With everyone’s agreement, the captain proceeded to their rescue. 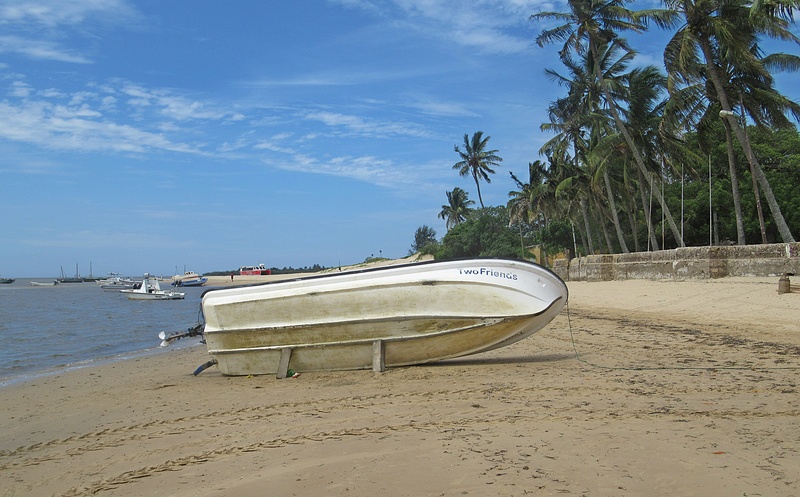 Getting stuck in a sand bank isn’t unusual in Maputo Bay. 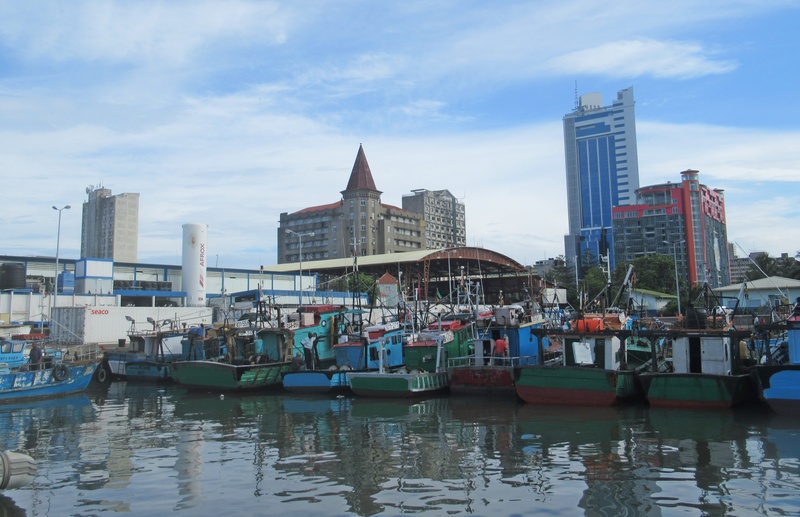 When it happens, boats wait until the tide rises to get free, and this can involve as long as a six-hour wait! 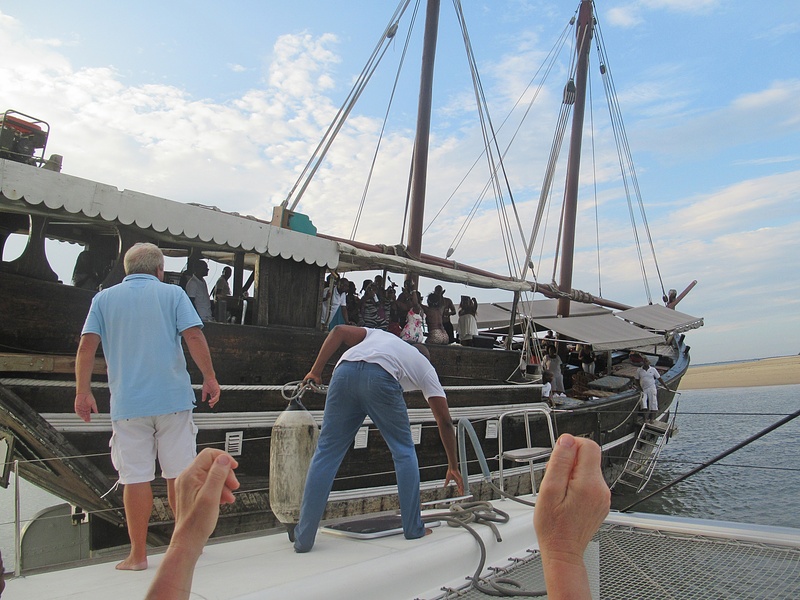 Sharing Umoja with the boisterous group was fun but certainly a roust from our peaceful sail. We laughed and partied with them – they brought their own bass-heavy music. We made it back to Maputo port at about 7:30 pm. 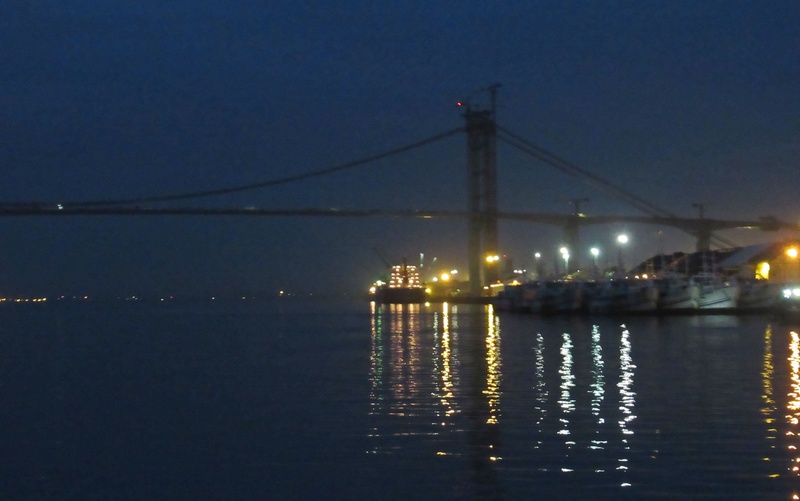 Our late arrival provided an unexpected surprise – beautiful views of Maputo’s city lights along the skyline! Clouds hid the sunset, but vivid scarlet pink streamed across the skyline – a perfect ending to an idyllic day! This entry was posted in Africa, Mozambique and tagged Bay of Pemba, Bazaruto Archipelago, Bazaruto Archipelago National Park (BANP), Bazaruto Island, Benguerra Island, Cabo Delgado Province, Capulana Mozambican Sarong, Chihoca Language, Coralline Outcrops, Dugongs, Flamingos, Hawksbill Sea Turtle, Ibo Island, Inhaca Heron, Inhaca Island, Leatherback Sea Turtle, Loggerhead Sea Turtle, Loggerhead Sea Turtles, Magaruque Island, Maputo, Maputo Yachting, Mozambique, Mozambique Channel, Olive Ridley Sea Turtle, Pacific Green Sea Turtle, Pangane Beach Mozambique, Pemba, Pink-Backed Pelican, Portuguese Island., Quirimbas Archipelago, Quirimbas National Park, Santa Carolina Island, Santa Isobel, Santa Maria Reef, Sharia Law, Vahoka People, Vilanculos District by suemtravels. Bookmark the permalink. Looks idyllic but even more so to know that marine life is well protected. So good to hear about the dugongs too but sad to know how Mali is affected by terrorist upheaval. No wins for ordinary folk or nature with these groups.